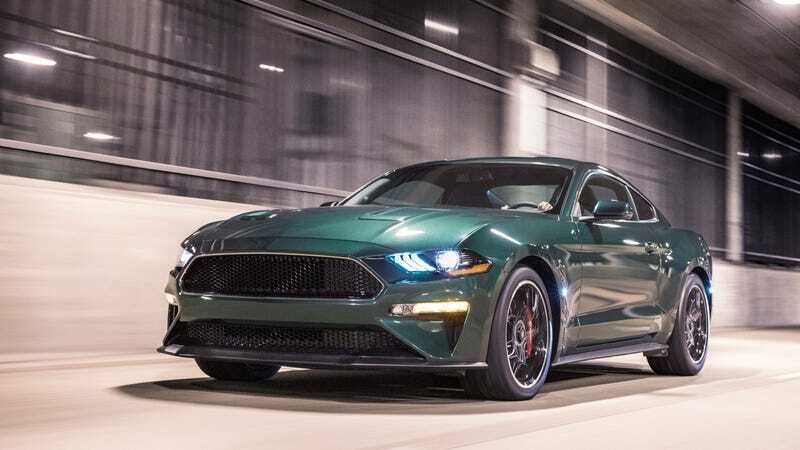 The 2019 Ford Mustang Bullitt. Often, when the words “Ford Mustang” and “crashing” are written in the same headline, said crash wasn’t intentional. But this one most certainly was, and it landed one Indiana theft suspect a new, $52,000 Ford Mustang Bullitt to drive around—until the car was found at a nearby apartment complex, that is. Evansville, Indiana news station 14 News reports that early on Wednesday, a member of the local Town and Country Ford dealership’s cleaning staff arrived at work to see glass shattered around the showroom. What wasn’t there was the new, 480-horsepower Bullitt-inspired Mustang the dealer had on display, listed for $51,760 and equipped with a six-speed manual transmission. The scene led the dealership’s manager to think someone broke the window to a door to get inside, hopped into the Mustang, and, a fitting movie fashion, drove it through some glass doors to get it out of there. The problem is, no one has been able to obtain photos or video of it yet—for a variety of reasons. The suspect who stole the car didn’t continue on with the movie-style theft, though. Local outlet WEHT reports that the incident was reported around 5:30 a.m. on Wednesday, and that the Bullitt Mustang was found around 8 a.m. that day in the parking lot of a nearby apartment complex. As of the 14 News report from Wednesday, investigators still hadn’t found the driver. This particular 2019 Bullitt, listed for about $5,000 over the model’s roughly $47,000 base MSRP, still appears to be advertised at full price on the Town and Country Ford website. But 14 News reports that the dealership plans to fix the damage done when the Bullitt was crashed through the doors and sell it at a “reduced price,” although neither news report nor the dealership’s Facebook page had photos or video of the damaged vehicle after the theft. Oldham told WEHT that he couldn’t understand the reason for the theft, since the person could’ve come by the dealership while it was open for a test drive. He’s got a point, considering their big heist seems to have turned into nothing more than a short drive to an apartment complex down the street anyway.